If you’re the kind of pet parent who is already wary about giving your pet either chicken- or beef- based dog food that it is already causing them a lot of allergies, then perhaps you will find the Zignature dog food brand to be somewhat designed especially for you. Its formulations utilize only the best possible high-quality novel animal proteins sourced from all parts of the world. Zignature dog food reviews highlight the brand’s insistence on formulating canine diets that are based on two fundamental principles: meat first and limited ingredient. It’s time to put this brand of dog food under the microscope and see what is making a growing number of pet parents so excited. One of the brand’s bestsellers is this Zignature limited ingredient dog food formulation that contains a single animal protein plus 7 other different ingredients to give your pet just the right levels of minerals and vitamins that it needs to maintain its essential physiologic processes and thrive to be the healthiest hound in the land. Its high-calorie, high-protein formulation makes it an easy Zignature puppy food, taking good care of your little hound’s growth and development requirements while allowing it to enjoy its young life of discovery to the fullest. It’s got a good ratio of essential fatty acids for cardio, immune, and integumentary health. The Midwest-sourced, farm-raised turkey provides complete essential amino acids, enough to make sure every bit of tissue in your pet’s body reaches their full maturity. 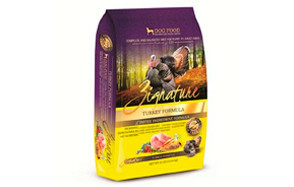 The Zignature turkey dog food doesn’t contain any grains or ingredients with high glycemic indices, too, lowering your pet’s risk for diabetes. Give your pet a feast that features lamb as its principal ingredient with this Zignature limited ingredient dog food formulation and your pet will be reaping the full benefits of just 10 carefully-selected, nutrient-dense ingredients. This Zignature lamb dog food comes with premium quality, grass-fed lamb sourced all the way from New Zealand and mixed with a good dose of high-quality lamb meal. There are no allergenic ingredients in this formulation of Zignature dog food. Ingredients like chicken, soy, wheat, corn, and other potentially allergenic ingredients are all ditched in favor of low-glycemic index, hypoallergenic peas and chickpeas. Your pet will be having a really delicious dinner made from one of the most famous animal proteins from the land of the Kiwis, complete with antioxidants, essential fatty acids, and an array of micronutrients to get your pup and dog on the way to healthier living. 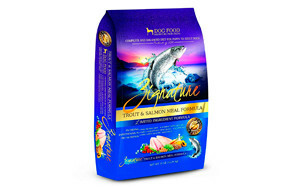 Freshly caught from the fertile waters of the American Northwest, the trout and salmon ingredients used in this formulation of Zignature dog food provides pets with the right levels of DHA and EPA they will need to help enhance the health of their immune, cardio, nervous, and integumentary systems. And because of its EPA and DHA content, one can consider this to be a great Zignature puppy food. Chickpeas, peas, dried beets, carrots, blueberries, and cranberries are thrown into the mix instead of the usual potatoes, rice, soy, corn, or wheat. You won’t see any chicken or egg ingredient, too. It may have a slightly lower amount of protein compared to the Zignature turkey dog food formulation, but it is still considerably higher than other brands. Moreover, it always emphasizes animal proteins as its main ingredient and not some carbohydrate filler. Let your hound hop Down Under for a taste of the famed kangaroo meat caught by the bushwhacking buckaroos of the Australian Outback. Or, you can simply buy this Zignature Kangaroo formulation of the brand and let your pet have a taste of the wild and exotic flavors of the Outback. While it is highly unusual, one can always rely on this formulation of Zignature limited ingredient dog food to be a lot friendlier to your pet’s tummy than cramming it with beef or chicken as well as the other allergenic substances that most pet food brands put into theirs. It may not have as high protein levels as the other variants of Zignature dog food, but the Zignature Kangaroo blend more than makes up for it with its bevy of essential fatty acids, amino acids, antioxidants, and other health-giving micronutrients for optimum canine development. If a single animal protein is not enough for your pet or your hound simply doesn’t have a need for a limited ingredient diet, then the Multi-Protein formulation of Zignature dog food is going to be a sure hit. Featuring 4 highly novel proteins that include US Midwest turkey, New Zealand lamb, French duck, and US Northwestern salmon forming the core of this canine diet, dogs are going to be treated to a rich blend of nutritious goodness. It’s a dog meal that combines the rich bounties of the natural world. The EPA and DHA supplied by salmon works essentially well with the complete essential amino acid profile of turkey, duck, and lamb while limiting the calorie content to more desirable levels. Wholesome chickpeas and peas provide low-glycemic nutrition to your pet while making sure that your hound also gets the omega-6 fatty acids it needs to match well with the omega-3s. The Zssential is simply one of the best foods you can ever give to your loving hound. The philosophy of Zignature dog food is largely based on two very important principles. First, a dog’s diet should always contain as minimal ingredients as possible to help avoid any possible interactions among the nutrients contained in such ingredients. This also helps minimize the incidence of upsetting the dog’s tummy, making sure that should something go wrong the culprit ingredient can be easily identified. The second principle that the Zignature dog food brand adheres to is its ‘meat first’ philosophy. The main ingredient in its formulations is always premium-quality meats or fishes, making sure that all the essential amino acids needed by a growing pet are delivered whole. 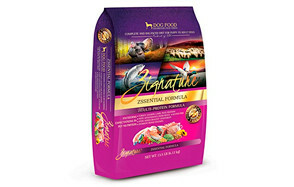 Zignature dog food is manufactured by Pets Global with its main office located in Valencia, CA. The brand has partnership with some of the country’s most trusted kitchens specializing in pet food such as the Performance Pet based in Mitchell, SD and Tuffy’s up in Perham, MN. Unlike other pet food brands, Zignature dog food hasn’t had any history of product recalls. A search through internet resources also came out empty. This should be welcome news for pet parents who are wary about issues with product safety. There are quite a number of reasons why you should choose Zignature dog food. For starters, they always emphasize the need to put animal proteins at the top of their ingredient list. Now, if you’re a vegan or a strict vegetarian, this is not the dog food for your pet. But, if you’re a firm believer in the evolutionary diets of dogs, then this brand is definitely made for you. The brand also boasts of chicken-free formulations. While some products brand themselves as hypoallergenic diets, it makes one wonder whether chicken is allergenic or not. Sure, they will remove wheat, corn, and soy from their ingredient list, but they will still put chicken or beef as the main ingredient. When Zignature says its diets are hypoallergenic, it avoids putting into its formulas any of the known allergenic proteins in the world; including beef and chicken. While some brands put potatoes and other starchy ingredients in their formulas, Zignature does not. In fact, a review of its bestselling products reveals that it only uses peas and chickpeas as its main source of carbs. This is great news for pet parents who may have dogs that have poor glucose control and are prone to developing diabetes in dogs. The fiber content of Zignature dog food is also slightly higher than competition at 6.7%. And while the brand doesn’t include prebiotics and probiotics in its formulations, the increased fiber content can help pave the way for better digestion. This also helps facilitate the easier and more efficient removal of wastes from the dog’s digestive tract, ensuring optimum function and enhancing nutrient absorption. Perhaps the only downside to the brand is its hefty price. However, considering all the benefits of a meat-first and limited ingredient formulation plus the use of novel and easily digestible proteins, the Zignature brand of dog food is still a worthy canine diet to buy. Many pet parents cite Zignature’s unique nutrient formulation to be one of its strongest selling points. In this section we will see just how good the brand is in terms of the nutrients that it provides. The guaranteed analysis of Zignature dog food ingredients puts its protein content at 29.4%. When this is adjusted to compensate for the amount of moisture present in its formulas, it comes in at 32.67% proteins. While this pales in comparison to canned dog food that can have as much as 50 to 55 percent proteins on a dry matter basis, it is still several notches higher than more popular brands of dog food. Perhaps the most telling of all is that, unlike some products, Zignature never puts a carbohydrate or a plant protein as its first ingredient. For the brand this goes against one of their core principles where meat ingredients should always be first. This is important since animal meats provide the complete line of essential amino acids, eliminating the need for supplementation. Additionally, meat proteins are a lot easier to digest owing to the unique anatomy of the canine digestive tract. Another plus that we’d like to point out is that the brand doesn’t use very common animal proteins like chicken and beef. Instead, it incorporates seldom- if not rarely- used animal proteins in its mix. Consider for instance kangaroo, Guinea fowl, trout, catfish, whitefish, and goat. These are quite rare in dog food. Sure, whitefish is present in some products, but not as principal ingredient. Other not-so-novel animal proteins include venison, lamb, turkey, duck, salmon, and pork. We consider these proteins as not-so-novel since there are now a growing number of brands that incorporate these ingredients as well. What’s even more remarkable is the fact that the brand sources these animal proteins from the rest of the world. It sources its farm-raised duck from Western France, its wild kangaroo meat from Australia, and its grass-fed lamb from New Zealand. Its aquatic proteins are sourced from the US Northwest while the other ingredients come from the Midwest. Zignature dog food products contain about 15.6% of fats on average. When its dry matter weight is computed it has a fat content of 17.3%. This is slightly lower than the usual average fat content of other dog food brands at 18 to 19 percent on a dry matter basis. Zignature’s unique formulation allows dogs to obtain the full benefits of a protein-rich and moderately-low fat diet primarily because of the use of premium quality novel animal meats. Kangaroo, goat, and lamb, for instance, are considered lean meats. They have more protein-rich flesh than flabby fat. That is why the formulation of Zignature is quite unique because it can afford to provide dogs with a rich source of high quality proteins, but with less of the fat that often accompanies these meats. A computation of the protein and fat content of Zignature dog food puts its carbohydrate content at 40% on a dry matter basis. This roughly translates to 38% of the total amount of calories supplied by Zignature. A more remarkable attribute is the exclusion of carbs that have high glycemic index such as potatoes. It also avoids putting allergenic grains like corn, wheat, and soy. Instead, the brand relies on peas and chickpeas for its carbohydrate composition. This is added with carrots, blueberries, and cranberries for their amazing antioxidant properties. The ingredients of Zignature comply with the required nutrients outlined by AAFCO. In some cases where the brand deems it necessary to add supplements, it does so rather judiciously. The use of premium-quality animal meats already guarantees optimum nutrition for pets. The addition of healthy fruits and vegetables as well as wholesome lentils gives its formulations a micronutrient profile that is filled with antioxidants and physiologically-important vitamins and minerals. With novel proteins like kangaroo, Guinea fowl, catfish, and a whole lot more forming the meat composition of their diets, the Zignature dog food brand is a diet that’s perfect for doggies with sensitive tummies. The brand doesn’t use any of the more common allergenic proteins that dogs have been sensitized to nor the ingredients that can increase their risk for diabetes. As many Zignature dog food reviews have already shown, the brand makes for a great diet for dogs; that is if you don’t mind its hefty price tag.